This Premier Canopy Tent Top ONLY for 30 Foot Mid Sections is not so much a replacement canopy top as it is almost an entirely new tent. 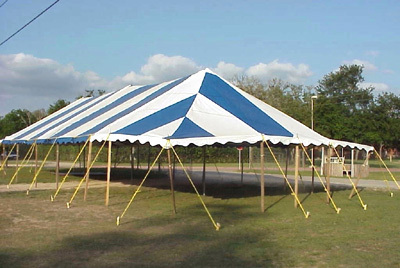 Both the tent frames and tent tops of these party canopies are built to the highest-quality specifications. In the unlikely event that something does happen, though, never fear - a replacement top will breathe new life into your favorite outdoor structure. The sturdy canopy top is built of super-strong 15-oz laminated 'Black Out' vinyl. This offers you and your friends or guests all of the protection from wind, rain, and sun that can quickly turn a day outside from a perfect afternoon into a real headache. The two-inch seatbelt webbing around the perimeter provides the most secure anchor to the tent frame you could ever ask for. The tent top even comes in a convenient bag and is designed to be taken up and down as many times as you'd like without being any worse for the wear. Maybe a tree fell on your old canopy roof, maybe you're looking to add on to your current party tent, or maybe you're just ready for a new look. Whatever the case, fill your needs with the highest-quality canopy option available. The Premier Canopy Tent Top ONLY for 30 Foot Mid Sections is the perfect accompaniment both to a quality tent frame and to getting the most enjoyment out of utilizing your outdoor space.